A new platform for high-quality, peer-reviewed astronomy education activities has been launched by the IAU Office of Astronomy for Development at the ESA/Galileo Teachers Training Program Workshop, Leiden, Netherlands. astroEDU is a platform that allows educators to discover, review, distribute, improve and remix astronomy education activities, and offers a free peer-review service by professionals in education and science. Hundreds of thousands of astronomy education activities exist, but their quality is highly variable. 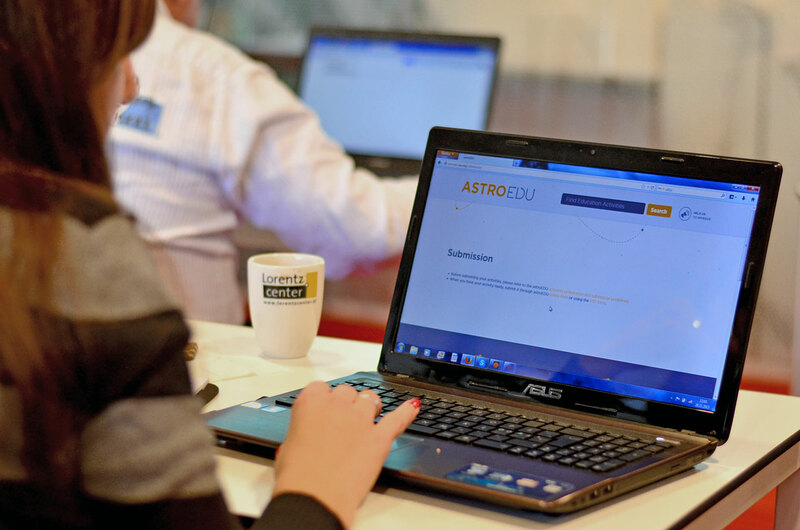 Using the familiar peer-review workflow of scientific publications, astroEDU is improving standards of quality, visibility and accessibility, while providing credibility to these astronomy education activities. astroEDU targets activity guides, tutorials and other activities in the area of astronomy education, prepared by teachers, educators and education specialists. Each of the astroEDU activities has been peer-reviewed by an educator and an astronomer to ensure a high scientific and educational standard. All reviewed materials are then stored in a free online database, using a framework which enables broad distribution in a range of different formats from print-friendly PDFs to mobile device document formats. astroEDU is currently available in English, although astroEDU currently welcomes submissions in any language. It is anticipated the platform will be offered in other languages in early 2014.
astroEDU is now seeking activity submissions, volunteers for referees and feedback to improve the platform. astroEDU is an IAU Office of Astronomy for Development project. astroEDU is implemented by Universe Awareness, LCOGT and Leiden University. Technical implementation is partially funded by the European Union (FP7/263325). The International Astronomical Union (IAU) is an international astronomical organisation of almost 11 000 professional astronomers from 90 countries. Its mission is to promote and safeguard the science of astronomy in all its aspects through international cooperation. The IAU also serves as the internationally recognised authority for assigning designations to celestial bodies and surface features on them. The IAU Office of Astronomy for Development (OAD) was established to implement the IAU’s decadal strategic plan, which aims to realise the global developmental benefits of astronomy. The OAD focuses on three areas: (i) universities and research, (ii) children and schools, and (iii) public outreach. Regional and language centres are currently being set up around the world to drive the implementation of the strategic plan locally. UNAWE was initiated in 2005 with support from the Royal Netherlands Academy and the Netherlands Ministry of Education, Culture and Science. It was selected as a Cornerstone project of the successful UN-ratified IAU/UNESCO International Year of Astronomy in 2009 (IYA2009). During IYA2009, thousands of UNAWE activities were organised in more than 40 countries reaching hundreds of thousands of children. Las Cumbres Observatory Global Telescope (LCOGT) is deploying a global network of 1-meter telescopes. There are currently nine 1-metre class telescopes, in addition to the two 2-metre class Faulkes Telescopes in the network. Both classes of telescope support photometry and spectroscopy. An adaptive network scheduler that optimizes observations, moving them around the globe to avoid technical or weather obstructions is currently undergoing astronomical beta-testing. This global, networked model is a radical departure from typical site-bound telescopes.